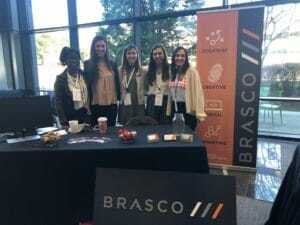 Brasco /// was a sponsor for this year’s Southeast Women in Tech Summit on Saturday, November 17th. The women of Brasco /// attended the event, introduced a speaker, and represented the company at a sponsor table for the day. Here are our 3 main takeaways. IMPORTANCE OF KNOWING YOUR WORTH. Something many of us forget to spend time working on is knowing our worth in the workplace. This event was led by inspiring and successful women whose secrets to success all stem from knowing what they are worth. Many of us suffer from “imposter syndrome”–basically feeling like an imposter in the workplace who is pretending to be worthy of the job they’re being paid to perform but don’t feel that they actually are. This conference reminded all the women in the room that they are fully competent and why they should wholeheartedly believe in themselves. IMPORTANCE OF LEARNING TO NEGOTIATE + FIGHT FOR WHAT YOU DESERVE. A hugely important and tangible skill learned at the Women in Tech Summit was the importance of negotiation and how to do so. Women are statistically less likely to fight for the pay and treatment they deserve because they are not as comfortable or confident in knowing what they are worth (oh hey, that sounds familiar). A key theme of this year’s conference was educating yourself on what you deserve and going into negotiations with solid facts and data. So many women are underpaid but are afraid to ask for more, but the WITS taught the women in the room to dig deep and arm themselves with data to learn their worth. This is one of the most important but underutilized skills a woman can leverage for herself in the workplace and something that was so impactful for the women at this year’s summit to learn about. IMPORTANCE OF WOMEN SUPPORTING WOMEN. Lastly, when collecting feedback from each of the Brasco /// women, there was a common theme in our main takeaways: the empowerment felt by being in a room full of women from a variety of industries who wanted to lift each other up. Events like this one remind women that they are strongest when supporting each other.